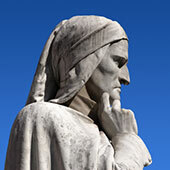 As John Kinder reminds us, last year was the 750th anniversary of the birth of Dante Alighieri, the author of the Divine Comedy. To recollect that we stand on the shoulders of religious and artistic giants is a good antidote to pride, the topic of Chris Friel’s exploratory investigation. So too is to learn the way in which our church communities are struggling to engage our youth, as revealed by Darren Cronshaw, Rowan Lewis and Stacey Wilson. Gwayaweng Kiki and Ed Parker continue their investigations on theological education in the Melanesian context, while Neil Ormerod extends our last issue’s conversation on secularization and sacralization. Enjoy.